International Cub Cadet garden tractors manufactured by International Harvester Company. During the 1960's International Harvester Company initiated an entirely new line of lawn and garden equipment. This was a radical departure from the usual farm implements but reflected the rising popularity of country homes and a resulting need for small power equipment. The first of these items was the Cub Cadet tractor, available in three basic engine sizes - 7, 10, and 12 horsepower. These small outfits had a wide variety of Cub Cadet and aftermarket attachments available, including lawn mowers, blades, snow blowers, rotary tillers, front end loaders, dump carts, and other items. 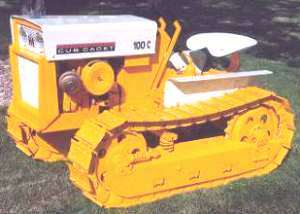 Information about these International Harvester Cub Cadet models is the focus of this site. Company advertising of this time noted that after thorough field testing, Cub Cadets were tested by "boys - acknowledged by many as the world's worst destructive force!" The Cub Cadets came through this test in good shape - a credit to the childproof safety built into these units. In addition to many safety features the Cub Cadets included extra rugged construction, instant starting, and a "sweptback" hood design. The engine serial number is stamped on a plate on the left side of the engine. The chassis (or tractor) serial number will be found stamped on the right side of the reduction gear housing. 'Original' Cub Cadet available only with a 7 HP Kohler (K-161 Series). Production of the Cub Cadet 70 and Cub Cadet 100 began with Serial number 65458. The 70 was available with the 2-7/8 X 2-1/2 inch (K 161 Series) 7 HP Kohler engine. The Cub Cadet 100 had a 3-1/4 X 2-7/8 inch (K-241 AS) Kohler engine that produced 10 HP. The chassis numbers run consecutively regardless of the tractor model, however, no attempt was made to have the engine and chassis serial numbers correspond. Whenever the terms "right" or "left" and "front" or "rear" are used, it is understood to mean from a position behind and facing the equipment. 71 - 102 - 122 127161 - 218009 1965 - 11/67 mounted engine. 72 - 104 - 105 - 124 - 125 218010 - 306085 11/67 - 8/69 Narrow frame, quick hitch. 73 - 106 - 107 - 126 - 127 307000 - 400000 8/69 - 8/71 Solid mounted engine. 800 Cadet 530001 - 572876 10/74 - 12/75 Wide frame. ISO mounted engine. Elec. P.T.O. Cub Cadet 100 Crawler done by Dan Hoefler. Click on image for details. Go to it from here but be sure to come back and visit often to see what changes have been made. Dan Hoefler's Cub Cadet 100 Crawler is truly a work of art. An engineer by profession and master machinist/artisan in his off time, see the result of 1300+ hours in his home shop. Cub Cadet Forum Archive A diligent forum reader has preserved most of the first 1000 plus postings before the great crash (BGC). For a lot of information check here. It is browser searchable, very informative, fun to read, and will give new readers a bit of background about the 'Great Oil Controversy', when Hydro Owners came out of the closet, required penance for allowing 'unclean' Brand X visitors to stay under same roof, and other topics pertinent to IH Cub Cadet fiends. For those of you who are interested in toys here is a page just for you. Check in here to see some 1:16 scale Cub Cadet toys. I came across an IHC Outdoor Power Products consumer brochure from the 1970's and thought it may be of interest to some of you. It contains a lot of information and pictures of the accessories available back then. Also some neat photos of a Cub Cadet section of a typical IHC dealership. WOW ! ! Check out those hairdos and fashions of the day! See it here. DISCLAIMER: This website contains no material provided by MTD Products Inc, is not affiliated with or sponsored by MTD Products Inc, which owns the CUB CADET trademarks. It is not an official MTD Products Inc, website, and MTD Products Inc, is not responsible for any of its content. The official MTD Products Inc, website can be found at: www.mtdproducts.com The information and opinions expressed on this website, including the bulletin boards and/or chat rooms hosted on this site are the responsibility of the website's owner and/or visitors, and do not represent the opinions of MTD Products Inc.